Several people have suggested that I should write a book about rescue – a dog rescue handbook or manual on how to start a non-profit rescue organization. I decided to look for an existing book that fits the bill. I purchased the Kindle Edition of Misfits as the first possibility for review. The first 40% of Misfits didn’t interest me at all, as it was simply a compilation of personal stories about some of the author’s various foster dogs. The stories do contain some good medical info (sourced from other books and websites) however, which could be very useful to some readers. The next 20% of the book has excellent information for volunteers new to rescue. Although the author’s writing style is disorganized and the book was apparently not proofread before being e-published, the information contained in the center chapters is valuable enough to justify purchasing and reading the book. It gives an overview of, and sound advice regarding, owner surrenders, transports, fostering, adoption applications, home visits, insurance and inevitable euthanasia. The last portion of the book contains a toxic plant list, a list of internal parasites, and the reference list (mostly for the medical info quoted in the first portion). This could be a handy reference for someone new to rescue and fostering to have on hand. 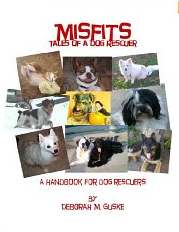 Misfits can’t be used as a guide for starting a rescue organization, but it IS a very good introduction to the rescue world and a decent quick-reference for health issues. Reading this book could help prepare new rescue volunteers and also help them understand some of what is involved in the “business” of rescue. Misfits is available from Amazon as a Kindle ebook.